Like so many people these days, I'm pretty big on green cleaning. And although I fancy myself an accomplished DIY expert, I'm also incredibly prudent. Which means that I try my very best to hand-make all my home cleansers -- but I also keep a well-stocked "backup" cabinet for emergencies. You know, like when you need to run the dishwasher but you're all out of washing soda so you can't mix up your trademark homemade dishwasher detergent and the plates are piling up and the store is closed? Like that sort of emergency. That's why the backup cabinet is so essential. And my backup cabinet has housed many products as I've tested my way through the green cleaning marketplace. We're lucky these days, with so many options to choose from. But, all those options can also make it hard to differentiate the really awesome companies from the bogus, green-washed wannabes. So I'm here to share my experience, and hopefully offer a little insight. I recently discovered a little company called The Good Home Co, and spoiler: I freaking love them. Let's just start with an overview of this awesome company, shall we? Not at all new to the green-cleaning game, New York-based Good Home Co was founded in 1995. So we know they're not just trend-hoppers. These guys are legit, and I'm incredibly impressed with their commitment to a higher standard. Their entire line is 100% free of sulfates, phthalates, and parabens. Everything is vegetable-based and cruelty-free, never having been tested on animals. They use allergy-friendly high quality fragrances and food/cosmetic-grade coloring. And finally, they are 100% made in America! Do you love them too? You gotta just love that, right?! I love this dish soap for many, many reasons, not the least of which is the lovely lavender scent and the bright, cheery color. Such things should not be dismissed as trivial! Using this dish soap actually brings me pleasure, and that is valuable in and of itself; with all the time we spend in our kitchens, a good environment is essential, as any San Diego remodeler will tell you. But the real value comes in what it's not bringing me, namely environmental toxins, artificial ingredients, and harsh chemicals. This dish soap is all natural, biodegradable, and made out of plants. I just adore it. As for performance, it really does excel. It's got a nice soapy feel and it makes a lot of suds, which I like. It's also got staying power -- a little goes a long way. I can't think of any drawbacks, actually. I give it a 10/10! 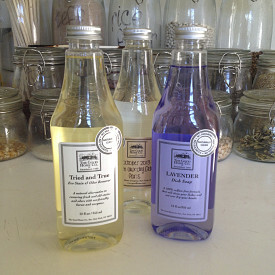 This eco-friendly laundry soap is wrapped up in such pretty bottle, and it comes in over 30 different fragrances. Champagne? Avocado? Italian Citrus? I don't even know what "Pamplemouse" is, but I definitely want to try it -- along with all the other enticing scents! This time I sampled Paris, and it was like a lovely mix of sweet perfume and fresh rain. Just delightful -- and perfect for my laundry. This laundry detergent is both standard and HE washer compliant, so it works wherever you need. But my very favorite feature is that this soap is enzyme-free. Many products use enzymes because they're so effective in breaking down dirt and stains. However, they also break down fabric! I love that this laundry detergent is safe for my delicates, my lace, and my fine linens. And of course, it still performs on par with any other laundry detergent. In both cases -- for both the dish soap and the laundry detergent -- my only real complaint is that I wish I had an endless supply. So no question, in my experience The Good Home Co gets two wildly-waving enthusiastic thumbs up! Sayward Rebhal writes for Networx.com.